Letter from D. W. Turner, Capt. Co. A, 114th New York describing Asa Holmes’ death. This letter was written by Pvt. Asa Holmes (1816-1863) who enlisted in Co. A, 114th New York Infantry on 1 August 1862 at Oxford, Chenango County, New York, to serve three years. He died of chronic diarrhea on 1 (or 2) November 1863 at Barracks Hospital at New Orleans. Asa was the son of John Holmes (1760-1849) and Esther Wilcox Ensworth (1776-1863) of Oxford, Chenango County, New York. Asa wrote the letter home to Oxford where his wife, Eliza Ann (Odell) Holmes (1817-18xx) and their two children — Mary A. (b. 1842) and Frank (b. 1850) — were residing. By 1863, his son Frank was 13 years old and his daughter Mary was 18, married, and the mother of a child. Seven companies of this regiment were recruited in Chenango county and three in Madison. They rendezvoused at Norwich, where the regiment was organized, and mustered into the U. S. service for three years, Sept. 3, 1862. Three days later it started for the front, moving to Binghamton by canal boats, and proceeding thence to Baltimore. In November it sailed for New Orleans as part of Banks’ expedition, and on its arrival there was assigned to Weitzel’s (2nd) brigade, Augur’s (1st) division, 19th corps. It was stationed for a time at Brashear City and neighboring points, and was first engaged at Fort Bisland, where it had 11 men wounded, 3 mortally. It did not participate in the Bayou Teche campaign, but joined its corps before Port Hudson, May 30, 1863, where it was actively engaged for 40 days in the siege and suffered severely in the grand assault of June 14. The loss of the regiment during the siege was 73 in killed, wounded and missing. 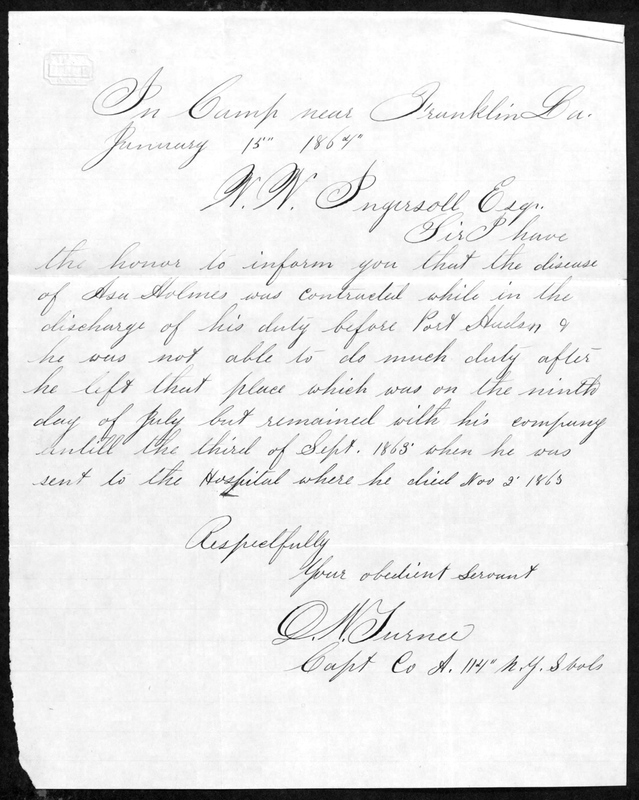 A letter from Asa’s captain states that Asa contracted the illness that killed him about the 9th of July but he remained with his regiment until 3 September 1863 when he was sent to the hospital. Asa was among the 192 men in the regiment who died of disease and other causes during the war. Well Frank, I am here yet. I have just come in off from picket. I have been out for twenty-four hours. We suffer from the heat amazingly. You think it is hot in old Chenango of the Fourth day of July? What do you think of it here now? It is very peaceable here now for a few days. The soldiers are a resting & appear to enjoy themselves very much. I think this state will come back into the Union before a great while. I think there won’t be much more hard fighting in this state. The Rebels is getting pretty tired of it. There will be some guerrilla fights, of course, but no more big battles, I think. We may have a pretty hard battle with the Rebel army that we have got surrounded here but I think they will surrender before fighting very hard. Our army has taken a great many prisoners already from it & they say the Rebel soldiers are deserting very fast. There is from ten to twenty comes into our lines every day. They say they have got tired of this war & won’t fight anymore. I was pleased to hear from Mr. Williams that he was so strong a Union man. You take such a man & if he is drafted, he won’t whine, but he will go like a brave soldier and fight to protect the Union forever. Well I feel very well now except my eyes. They are very weak since I got over the fever & jaundice. It colored my shirts very yellow. There is such a blur over my eyes that I can’t hardly see to write or read. I hope they will get over it as I grow stronger. They are very much as they was when I had the measles. That bothered me very much. I sweat so much it runs into my eyes and makes them smart so. Well, Mary A. Dealia, how do you get along — and Marting too? & the boy — is he well? If he is, I would like to see him. I will pay for his likeness if you will take the pains to send it to me. This is the last time I shall write about it. You can send it or not. I will pay all expenses. I shall have money by and by & if I die, you will have part of it — or your boy — so it makes no difference. Eliza, write to me whether you got my two letters I wrote before this. I don’t want none of you worrying about me. I am here & you are there — all of you — & I am but one alone by myself. Is Ma fetch round alright yet? I don’t let nothing trouble me. I sit here a writing while there is a regiment getting onto a transport for some place, I don’t know where. They are the Twelfth [12th] Connecticut that belong to our brigade. They have been with us ever since we have been in Louisiana. The 8th Vermont has got marching orders today for someplace too. They belong to Weitzel’s [2nd] Brigade too. It may be our [turn] next. We can’t tell. Well, Frank, I have got a good silver-plated knife I am going to fetch you when I come home. It is a dirk knife with a spring in the back of it. Write soon. Direct your letters as you always have. They will follow the regiment.